As longtime Seventh-day Adventist pastor Kris Widmer points out in the newest installment of the “Outspoken” video series, there is no pamphlet put out by the church for parents of transgender children. Kris Widmer is a lifelong, fourth-generation Adventist who has been a pastor for more than three decades. His wife Debbie Widmer is the daughter of an Adventist conference administrator and was baptized into the church early in life. In December 2011, their son Timothy came out as transgender by reading them a ten-page letter. That is when they went into the closet, as they put it. There were no resources available to help them process what they were experiencing, no one they felt they could talk to. 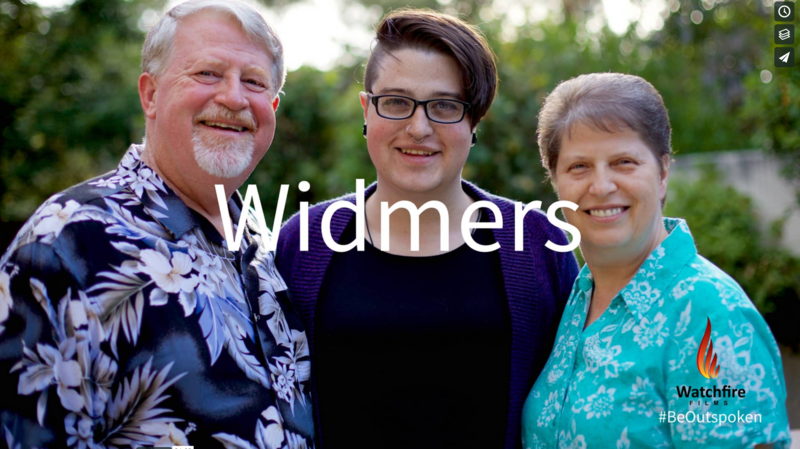 In figurative and literal ways, the Widmers open up in the "Outspoken" video about their experience of transitioning along with Timothy (now Teagan) in a church that officially understands trans people as rejecting a normative, biblical gender binary. As they unpack a box of hand-crafted figurines depicting the story of the prodigal son, the Widmers’ lives and experiences unfold in front of the camera. For Debbie, it took months of reading to understand what being transgender entailed and longer still understanding how to relate as a mother and as an Adventist. She said staying in the closet as a parent was an easy thing to do on the one hand but very unhealthy on the other. “I had to grieve the loss of Timothy before I had the open arms and open heart to bring Teagan in,” she said. The “Outspoken” series of short films produced by Daneen Akers and Stephen Eyer (Watchfire Films) celebrates the experiences and contributions of LGBT+ people and their families. All of the films’ subjects have ties to Adventism, though not all identify as current members.